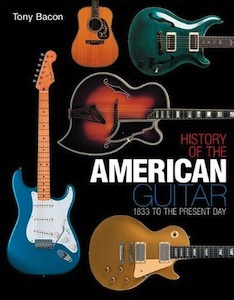 History Of The American Guitar is my take on nearly 200 years of American instruments. I tell the story through a collection of great guitars, from the earliest designs of the 1830s right through to the latest creations of today, all displayed in gorgeous big photographs. To start, I go back to the beginning, in 1833, as Christian Martin arrived from Germany to set up the Martin guitar company and define the blueprints for the American flattop acoustic. From that tiny moment, I take you on a widescreen tour of guitar history. Open the book at random, and you might see Orville Gibson and his handcarved guitars from the turn of the 20th century. Or the striking metal-body National resonators of the 20s and 30s. And there’s John D’Angelico and Jimmy D’Aquisto, refining the archtop guitar. All of this alongside Paul Bigsby’s solidbody innovations, an amazing line-up of Epiphone and Gibson jazz guitars, some beautiful Fender custom colours, a whacky Maccaferri plastic guitar or two … and then there’s a lot of lesser names, as well, like Micro-Frets, Stromberg, Wilkanowski, and more. I’ve brought you up to date, too, with the modern story, covering big and smaller makers to show how the past continues to inform the present. While we were working on the book – a brilliant period where we sifted our way through many of the greatest guitars of all time – Scott mentioned a common feeling among collectors. “I feel privileged that I’m in the position where I can take care of the guitars, that they are preserved for future generations,” he told me. “But really I’m just a caretaker now.” In fact, he didn’t have long to take care of them at all – he died suddenly in 2000, aged just 40. You can read an extract from one of the interviews I did with Scott while I was preparing the book by clicking on the link here. We published the original edition – see the jacket, below left – as The Chinery Collection, a limited-edition serial-numbered run of 6,000 copies. I think I still have Number 1 somewhere, or maybe that’s the one we gave to Scott. 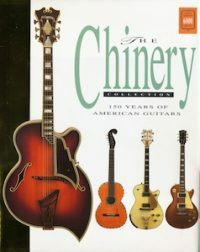 Anyway, we’ve since updated the book twice, first as The History Of The American Guitar in 2001 (jacket, below right) and then again in 2012 for the main one here, with the title very subtly changed (no first The] to History Of The American Guitar. So, here we are now, with History Of The American Guitar. It has a big historical sweep, and I hope it shows you how guitarists and guitar-makers have always influenced one another – across three centuries here – and how the guitar continues today as a proud voice in American blues, folk, country, jazz, and rock.